Apart from driving satisfaction, an Alfa Romeo car must also offer on-board well-being. And that means surrounding the driver and passenger with technologies that ensure the very highest acoustic and climatic comfort. The result is a cosseting, enveloping environment, free from vibration thanks to the careful soundproofing and the outstanding torsional and flexural rigidity of the body. 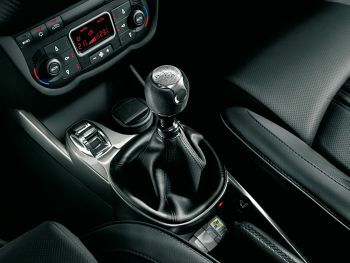 The following also contribute to the satisfaction of travelling on-board the Alfa Romeo MiTo: an automatic dual-zone climate control system, sophisticated radio and, as an option, a Bose® Sound System. Other features can also be ordered that represent the pick of the current crop of in-car telematic and satellite navigation devices. Interior climate is one of the main comfort factors during a trip and is also very important for preventive safety because temperature, humidity and ventilation affect the driver’s well-being and thus his or her level of alertness. And of course the heating and ventilation system is also responsible for demisting the windscreen and side windows. For this reason, the new model is available with two climate control systems: a manual climate control system and an automatic dual-zone system. In particular, the dual-zone device automatically controls temperature, air flow, air distribution, compressor activation and recirculation by means of an electronic control unit. The system also implements an equivalent temperature climate control strategy. Special sensors record internal and external temperature and assess the sensation of thermal well-being experienced by passengers, i.e. the energy exchange between human body and passenger compartment that is affected by humidity, temperature and treated air flow. Another sensor located in a central position at the base of the windscreen records solar radiation on the car and the angle at which the rays strike the passenger compartment. This allows the system to prevent an excessive increase in temperature inside the car caused by the sun’s rays and thus to inform the climate control system in time. The automatic dual-zone climate system can provide two different temperatures and air flows simultaneously: one in the right part of the passenger compartment and the other in the left. The very attractive audio package offered by the new model includes a radio and two sound system levels. It should be emphasised that, for the first time in its segment, the Alfa Romeo MiTo offers a double tuner that may, as an option, be fitted with a double aerial for up to 80% better reception. The first sound system comes complete with 6 speakers (two mid-woofers with a power rating of 40W, two 40W full range speakers and two 30W tweeters) while the second level comes with 8 speakers (four subwoofers with a power rating of 40 W and four 30W speakers). Both systems have in common the fact that system specifications and speaker arrangements have been painstakingly adjusted to fit the passenger compartment. The radio comes with a CD and MP3 file player and is built into the design of the dashboard and laid out in user-friendly fashion. They are located on the upper part of the dashboard (the correct arrangement for the driver) and are also within easy reach of the passenger, not to mention the fact that they can be managed using controls on the steering wheel. The radio comes with RDS (Radio Data System), TA (traffic news), PTY (a code used by radio stations to indicate the type of music they play so that the set can automatically select the type of music preferred by the listener). Every time the radio is turned on, the volume settings are the same as when it was turned off while another device automatically corrects equalisation on the basis of car speed. The customer can also choose between seven equalisation bands for personal setting of sound parameters. Not to mention the fact that all information is displayed in a clear and immediate manner because of the large display. Lastly, the Alfa Romeo MiTo radio may be connected both to the Blue&Me™ system and to the Bose® Sound System. The Bose ® Sound System produced for Alfa Romeo by the US company Bose, a leader in the Hi-Fi sound sector, offers each passenger exceptional listening quality under all driving conditions. The hi-fi system has a power output of 690 W (345 W regular power) and the sound system comprises eight speakers and a subwoofer with a 4-channel amplifier (320 Watts maximum power) built into the luggage compartment, which plays the lowest frequencies. The Bose® Sound System arouses the same emotions you feel when you listen to a live concert. The system offers realistic reproduction with crystal clear high notes and full, rich bass tones. It does not fall into the trap of creating unnatural sounds that are initially appealing but are tiresome for the listener in the long run. This result is achieved by four 6.5’’ speakers for medium frequencies - located in the front door panels and the side panels of the rear doors - and four additional tweeters for playing high frequencies - installed in the front pillars and in the rear seat panels. The Alfa Romeo MiTo is a bearer of new technology in terms of its engines and also in terms of the electronic systems it employs to ensure on-board comfort and wellbeing. The best example is the ‘Blue&MeTM’ system that adds major new features to aid musical enjoyment on this Alfa Romeo model. Customers can also equip their car with the ‘Blue&MeTM Nav’, an extremely effective pictogram navigation system that also allows access to a set of simple, useful on-line systems at the best price on the market. Another option is the ‘Blue&MeTM MAP’, a multifunctional portable navigation system, also developed with Magneti Marelli. The Alfa Romeo MiTo may be equipped with ‘Blue&Me’ (also with a Nav version), an innovative system created as a result of a joint venture between Fiat Group Automobiles and Microsoft, that changes the paradigms of in-car communication, information and entertainment to improve comfort and the quality of time spent on board. The device is extremely simple to use, and allows you to make/receive telephone calls and to listen to music simply and safely as you drive. And thanks to Bluetooth® technology, you can also communicate with the outside world from the car using your own personal devices such as mobile phones or handheld computers. The Blue&MeTM is also based on a system that is always able to keep pace with the times, with updatable, flexible and modular features. Fiat Group Automobiles and Microsoft, with the support of Magneti Marelli, also offer a platform that can be adapted to most mobile phones, music players or other personal devices to replace the current costly and rigid hardware with the great benefit of being able to constantly keep pace with market innovations and maintain perfect integration with the car. All at a very accessible price. The Blue&MeTM system also ensures the greatest safety and ease of use. Because the voice control system is fully integrated with keys on the steering wheel and information on the instrument panel display. Customers equipped with a Bluetooth® mobile phone can use it even if it is in a jacket pocket or handbag without ever taking their hands off the steering wheel. Not to mention the fact that ‘advanced voice recognition’ allows immediate interactivity - no voice learning stage is required - and also allows incoming texts to be read out. On this very car, i.e. the Alfa Romeo MiTo, the Blue&MeTM achieves a further step forward by adding new functions that confirm the platform’s great flexibility. By connecting the digital device to the USB port, it is possible to listen to hours and hours of digital music in MP3, WMA and WAV format recorded on mobile phones, MP3 players and USB pen drives. For greater compatibility with your i-Pod, it is now possible when in your Alfa Romeo MiTo to listen to music tracks with an AAC extension in addition to the above formats, provided they are free from digital rights (DRM) and saved in Hard Disk Drive mode. And more. For greater passenger comfort, the Alfa Romeo MiTo Blue&MeTM also displays information on music tracks on the radio display (they were previously available on the control panel). Alfa Romeo MiTo customers can also choose to equip their car with Blue&MeTM Nav, and that includes a navigation kit consisting of a USB drive containing the stored maps and a backup CD that may be used to transfer the maps to personal MP3 players. The Nav key has a direct connection to the navigation menu, that may also be accessed by means of steering wheel controls and voice commands. When the USB key is inserted, navigation may be started. The destination may be entered by selecting the initial letters of the address using the steering wheel controls, which may be completed using voice commands. By using the navigation program on a Personal Computer with the aid of the back-up CD it is possible to save maps for several countries purchased after sale on a USB drive. In this case it is possible to select an entire country (for example Italy, France, Germany, etc.) or a predefined part (for example northern/central/southern Italy) or even a region that incorporate several maps belonging to different countries (for example Northern Italy and Switzerland, Austria and Southern Germany). The Alfa Romeo MiTo offers on-line services developed in partnership with Telecom Italia and available on the Blue&MeTM Nav system (SOS, Info and Drive Me and InSure) that may be activated with complete freedom by the customer. ‘SOS’: the SOS emergency service, available 24 hours a day, 365 days a year, is activated by pressing the SOS button. In this case, a call and a text message containing the car’s position are forwarded to the operating centre. Whatever country customers are driving through, the call centre operators are able to put them at ease by answering them in the same language. The service also activates automatically if an airbag is set off. The vehicle will quickly be located and roadside and medical assistance will be available. The SOS may also be used in the event of illness or danger. These services will be free of charge during the car warranty period (after this they will be available by paying an annual subscription). ‘Info e Drive Me’: information at the service of the motorist. Wherever you go, it will always be easy to obtain assistance and up-to-date information on events, traffic conditions, restaurants, cinemas, night spots and much more in no fewer than five European countries: Italy, France, Great Britain, Germany and Spain. All you have to do is press the INFO button to speak to a dedicated operator who will answer all your questions or, if you prefer, send the coordinates of the chosen destination to the navigation system (at this point, the device will automatically compute the route). The INFO services will be ‘pay per use’ (the cost will be based on seconds of conversation with the service centre) and, an important feature of this system, no annual subscription be required: the cost is 2.4 Euro cents per second (1.44 euro/ min), plus 30 cents for ‘each call answered’. InSure: due to the satellite location system and agreements with most of the insurance companies, it will be possible to benefit from discounts on civil liability insurance (up to 20%) and also fire and theft insurance (up to 50%). If your car is stolen you will be able to trace it by tracking. It will also be possible to establish how many kilometres will be covered by the car and, on the basis of this figure, take out ad hoc insurance policies that are more advantageous because they are based on the customer's true habits and requirements. As the next stage in the development of the Blue&MeTM system, the Alfa Romeo MiTo can be equipped with Blue&MeTM MAP, a multifunctional portable navigation system developed with Magneti Marelli, a leader in the supply of original equipment navigation systems. With its distinctive original design and innovative car integration technology, Blue&MeTM MAP represents a new frontier in the markets of portable navigation systems and is also safe and easy to use due to its high level of in-car integration from an electrical/mechanical viewpoint and also from the viewpoint of connectivity. This new architecture offers many benefits, allowing direct integration between the portable navigation system and the car via the Blue&MeTM system: data from the vehicle CAN line are used to improve the precision of navigation and voice messages are played through the on-board sound system. All this helps to guarantee much higher standards in terms of both comfort and safety. In addition to mapped satellite navigation, Blue&MeTM MAP also offers multimedia functions that can also be used in portable mode, such as the playing of music and tracks and display of films and images..
Another a specific feature of the device is its mechanical and electrical integration with the car, which means that no extra wiring is required or the use of improvised supports. Alfa Romeo has also carefully designed the integration and ergonomic positioning of the new device in the dashboard in order to ensure easy installation and removability in accordance with specific motoring standards. In detail, the new portable navigation system uses wireless connectivity with the Blue&MeTM system to exchange information so that it can be used in complete safety with maximum comfort. The benefits include more accurate navigation than with conventional portable devices and also the possibility of navigating in tunnels or areas where GPS reception is difficult. It is also possible to manage all sound, radio CD, phone and navigation sources simultaneously. The system also offers all the functions of Blue&MeTM: hands free, USB port, steering wheel controls, voice recognition and SMS reader.